During the three part Ergonomics for Writers series, the sit-stand desk was suggested by ergonomics professional Mary Plehal. I have one at work, and lamented that I could not afford to purchase one for home use. Scott Miller contacted me with his review of a sit-stand desk he purchased for his wife, and his DIY plans to make another for himself. That prompted me to check on-line, where I found a consumer evaluation of five desk variations. Now I have hope that I can rig up something to enable me to stand during writing marathons. I became interested in sit/stand desks a couple of years ago. Watched some customer eval vids on YouTube, checked out some models, but couldn't afford one at the time. The hand-cranked models seemed like they'd be too hard to use to change desk height several times a day (which seems to be the whole point). The electric models (at that time) ran about $1100, give or take. Earlier this year my wife returned to work after a long illness and she was to work from home. We reopened the investigation into sit/stand desks. Found that Ikea had just added an electric sit/stand, and it was substantially cheaper than desks from others, but it lacked the memory feature. They call it the "Bekant" and it's $529. The top is kind of thin, but it's sturdy enough, and it went together easily. I even added a power strip to the underside along the back. She put her work computer on the left, her personal computer on the right, and uses the desk nearly every day. She changes the height several times per day and takes frequent breaks. The parameters for your selection will include cost, space, and physical needs. Sit stand workstation options can run from $300 to over a thousand. Working from home, you may have space limitations where a standard desk won’t fit. At work, my sit stand desk is mechanical. That is, I flip a lever and lift or lower my desk. You may need an electric version. My office will share a space with our library, in a skinny section of a big "L" shaped room. My current static desk is 29 1/2" deep. The depth is a limiting factor into the way my desk will fit into the skinny area. I'd love to get a Bekant desk for myself, but it's 2 inches deeper than my present desk. It'll work but I'd rather have the space. I'm pretty handy and have lots of useful tools, but the edging used on Bekant is a rubber strip (probably pressed into a groove) and the surface is like Formica. It's modifiable, but with no room for error. 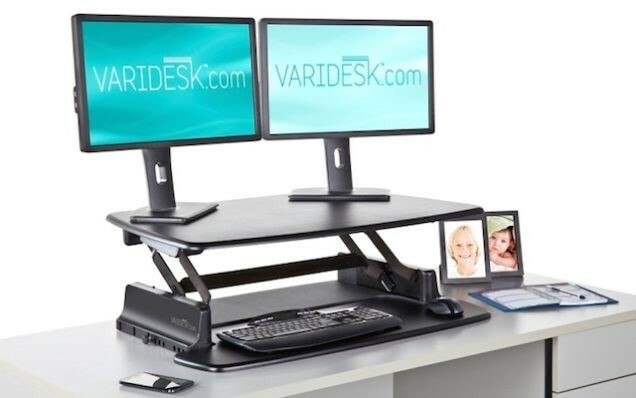 Scott discovered that he can purchase the “guts” of an electric sit stand desk, including the desk base. He plans to add his own desk top. But what sort of top? Ikea has a line of tables where the legs and tops come separately. Their "Gerton" table top is perfect for my needs. It's the same depth as my present desk, but 1 1/2" wider and only $90. 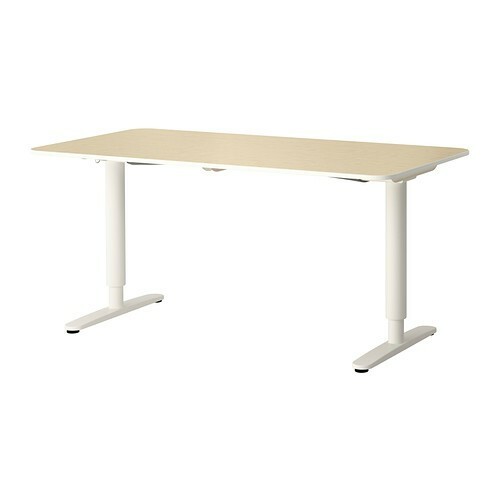 Gerton is thicker than top on the Bekant desk and made of solid beech wood. Gerton is also cheaper than solid pine counter tops and the like from Home Depot. Beech is a nice hardwood which is visually similar to oak (color and the rays), but without the dark ring pores. Gerton is just wood--no finish. So it's wonderfully modifiable for the handyman. I could round the corners, and drill holes at the back for cables. Ikea also has a similar-sized top faced in natural cork, "Sinnerlig." Can't really modify this one (holes maybe), but I like Gerton better. Scott estimates the cost of his DIY sit stand desk to be around $550, including shipping and tax. Now it’s time for me to get to work on my own home sit stand desk! All I need are a couple bricks and a board…. Unless I can talk my handyman husband into adding one more project to his list.